Search Help is a data dictionary object which is used to create a popup window that contains all the data related to your search. It is an input Help which permits the user to display a list of possible values for a screen field. 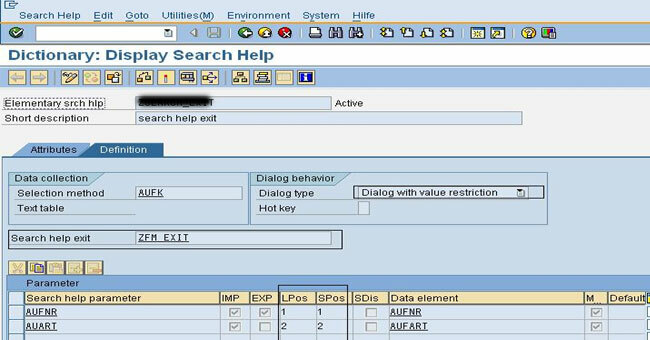 In other words, search help is a field help provided to the user whenever he presses a Search help button in executing an ABAP program. It is created by using T.Code SE11. 1. Elementary Search Help is created from a single table. 2. Collective Search Help is a collection of more than one Search Helps. 3. Press the Create button. 6. Type in "Short description" Elementary Search Help, "Selection method**" (TSTC in this case) and fields that should be displayed in the Search Help. 7. Notice that the text table of TSTC has automatically been included as we entered TSTC in the Selection Method. 8. Now "Save" -> "Check" -> "Activate" -> "Execute". You will see a popup window with all the fields you added. Press F4 on any of them to see how your first Elementary Search Help looks. 4. Type in "Short description" Collective Search Help and fields that should be displayed in the Search Help in the Definition Tab. 5. Now go to the "Included Search Helps" tab and enter the names of the Elementary Search Helps you wish to include into your Collective Search Help (ZCL_SHL in this case, Instead of the selection method, we enter the included search helps for the collective search help.). 6. Now select the line which contains your Elementary Search Help and click on "Param. Assignment**". 7. In the next screen, enter the parameter names of the elementary search helps to which the corresponding parameters of the collective search help should be assigned in the field Reference parameter. (We need to assign parameter for each of the search help included). You can select the parameters contained in the included search help using the input help. Create a proposal for the assignment with Proposal. 8. "Save" -> "Check" -> "Activate" -> "Execute". You will see a popup window (as shown below) with all the fields you added. Press F4 on any of them to see how your Collective Search Help looks.